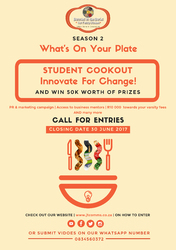 Using a digital cooking platform, What’s on Your Plate is an online cookout competition that challenges students to cook a meal using the “student, fridge and pantry” all while sharing their innovative and positive solutions to SA's problems. "We are aligning the campaign with Youth Month as we commend SA's future leaders. Creating a platform for the youth to drive the ideas that can shape and transform SA's problems to solutions, is an opportunity to empower the youth' explains JT Comms Marketing Manager Isabel Tapfumaneyi. “Entrepreneurship is about creating opportunities and, as we learnt in the Fees Must Fall campaign, students need to be able to create their own economies. The lack of finances affects students’ ability to sustain themselves and by linking entrepreneurship to youth education we are determined to be part of a solution,” added Tapfumaneyi. What’s on Your Plate invites corporates and businesses to partner with them in creating platforms of empowerment and supporting tomorrow's leaders today.